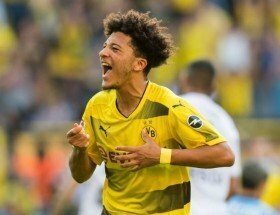 Manchester United have reportedly prioritised the signing of Jadon Sancho from Borussia Dortmund when the transfer window reopens in the summer. The Red Devils have been keeping a close watch on the attacker's proceedings at Dortmund over the past year, and they are now prepared to make a formal approach for his services. According to The Independent, the Mancunian giants have earmarked Sancho as their prime target to strengthen the attacking department in the summer but the youngster won't come on the cheap. Paris Saint-Germain and Real Madrid are also said to be monitoring the player's developments and it is claimed that United would have to cough up with a nine-figure sum with add-ons to enhance their prospects of signing the teenager. Sancho's potential arrival could pave the way for the departure of Alexis Sanchez, who has failed to settle since his move from Arsenal 15 months ago. The Chilean is currently recovering from a knee problem.